In See No Evil, one of the CIA’s top field officers of the past quarter century recounts his career running agents in the back alleys of the Middle East. In the process, Robert Baer paints a chilling picture of how terrorism works on the inside and provides compelling evidence about how Washington politics sabotaged the CIA’s efforts to root out the world’s deadliest terrorists. On the morning of September 11, 2001, the world witnessed the terrible result of that intelligence failure with the attack on the World Trade Center and the Pentagon. In the wake of those attacks, Americans were left wondering how such an obviously long-term, globally coordinated plot could have escaped detection by the CIA and taken the nation by surprise. Robert Baer was not surprised. A twenty-one-year veteran of the CIA’s Directorate of Operations who had left the agency in 1997, Baer observed firsthand how an increasingly bureaucratic CIA lost its way in the post–cold war world and refused to adequately acknowledge and neutralize the growing threat of Islamic fundamentalist terror in the Middle East and elsewhere. A throwback to the days when CIA operatives got results by getting their hands dirty and running covert operations, Baer spent his career chasing down leads on suspected terrorists in the world’s most volatile hot spots. As he and his agents risked their lives gathering intelligence, he watched as the CIA reduced drastically its operations overseas, failed to put in place people who knew local languages and customs, and rewarded workers who knew how to play the political games of the agency’s suburban Washington headquarters but not how to recruit agents on the ground. * In 1996, Osama bin Laden established a strategic alliance with Iran to coordinate terrorist attacks against the United States. * In 1995, the National Security Council intentionally aborted a military coup d’etat against Saddam Hussein, forgoing the last opportunity to get rid of him. * In 1991, the CIA intentionally shut down its operations in Afghanistan and Saudi Arabia, and ignored fundamentalists operating there. 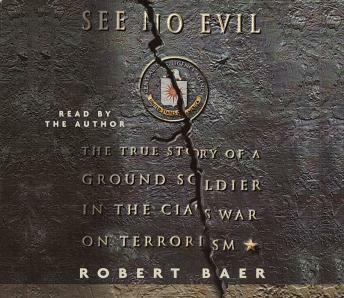 When Baer left the agency in 1997 he received the Career Intelligence Medal, with a citation that says, “He repeatedly put himself in personal danger, working the hardest targets, in service to his country.” See No Evil is Baer’s frank assessment of an agency that forgot that “service to country” must transcend politics and is a forceful plea for the CIA to return to its original mission—the preservation of our national sovereignty and the American way of life. This book is a memoir of one foot soldier’s career in the other cold war, the one against terrorist networks. It’s a story about places most Americans will never travel to, about people many Americans would prefer to think we don’t need to do business with. This memoir, I hope, will show the reader how spying is supposed to work, where the CIA lost its way, and how we can bring it back again. But I hope this book will accomplish one more purpose as well: I hope it will show why I am angry about what happened to the CIA. And I want to show why every American and everyone who cares about the preservation of this country should be angry and alarmed, too. The CIA was systematically destroyed by political correctness, by petty Beltway wars, by careerism, and much more. At a time when terrorist threats were compounding globally, the agency that should have been monitoring them was being scrubbed clean instead. Americans were making too much money to bother. Life was good. The White House and the National Security Council became cathedrals of commerce where the interests of big business outweighed the interests of protecting American citizens at home and abroad. Defanged and dispirited, the CIA went along for the ride. And then on September 11, 2001, the reckoning for such vast carelessness was presented for all the world to see.